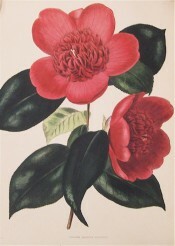 A cultivar of Camellia japonica L. ‘Bud large, scales yellowish; flower of a medium size, very double, irregular, cherry-red, No.3, sometimes of a clear red, slightly marked with white; petals generally roundish, and crenated at the summit; those of the centre rumpled, and deformed; stamens sometimes apparent, and at others demi-transformed.-Beautiful.’ [Berlèse Monography p.58/1838]. ‘This variety was introduced a few years since from China, we believe by Captain Rawes. We first noticed it at Mr. Kent’s collection, from whom we obtained it. At first sight the flowers much resemble the anemoniflora, but the colour is paler and the form more cupped: the leaves are also different, being much wrinkled, while of the other kind they peculiarly flat and smooth. It requires the usual management, may be increased by grafting on the single stock, and must be preserved in the greenhouse. It blooms in the same season as the other kinds; the flowers have the valuable property of remaining for a long time, and not dropping off while quite fresh, as is usual with anemoniflora.’ [LBC no.1475/1830]. Listed in the 1850 and 1857 catalogues [T.216/1850]. Crassinervis is listed in both the 1830 and 1836 editions of Loddiges’ Nursery catalogue, copies of which are held at Camden Park [CPA]. It was marked with an ‘x’ in the 1836 catalogue, usually meaning common before or long introduced. Its meaning here is unclear. But crassinervis was included among desiderata to Loddiges’ Nursery, 6th January 1845 [MP A2933-2, p.28]. This is the probable source.